Contact Wearers Plan For The Times You Can’t Wear Your Lenses, Please! Every 4-6 weeks I’ll see a patient who wears contact lenses who has a problem that requires them to discontinue lens wear for anywhere from 1-14 days. 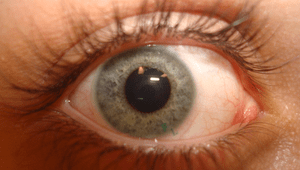 Typical causes are allergies that get way out of hand, Giant Papillary Conjunctivitis (an allergic reaction to lens deposits), corneal or conjunctival infections or corneal abrasions or other ocular trauma. These conditions almost never result in a permanent loss of the ability to wear contact lenses, but they all heal faster without lenses in the eye, and sometimes won’t heal with a contact lens in the eye. This means that patients must go without their lenses until things have returned to normal. Invariably I hear “how am I going to work/go to school/function without my contacts, my glasses are broke/10 years old/lost?” In an effort to reduce the frequency of these issues, we have a substantial selection of eye glass frames that our contact lens patients can purchase packaged with lenses (single vision, lined bifocals or no-line bifocals) at a very reasonable price. These are frames that come from vendors that we no longer order new inventory from or that are overstocks from current vendors. All are quality frames and come with any warranty that we can get from the manufacturer. Many would sell for close to $200 for just the frames but we offer them to our contact lens patients for less than that including lenses. So, if you wear contact lenses, be sure that you have a functional pair of glasses to wear when you either don’t want to or can’t wear your contacts!